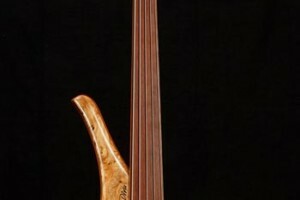 Gerald Marleaux’s artistic flair really shines through in his Diva model, a fretless bass with an avant-garde body shape and three-octave rosewood fingerboard. 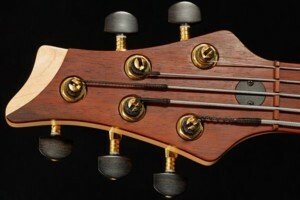 Designed to have an acoustic resonance reminiscent of an upright bass, the neck-through bass is built with a three-piece padauk neck with a custom choice of woods for the body wings and top. The Diva includes a single custom-made oval quad-coil pickup made by Delano, which can be switched between single coil, parallel, and series modes. The passive volume and tone control knobs are slightly recessed for a cool ergonomic feel. All the hardware can be either chrome or gold and is custom made by ETS and Schaller. 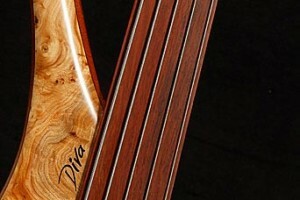 The Marleaux Diva is available in 4-, 5-, and 6-string models with further customization options. 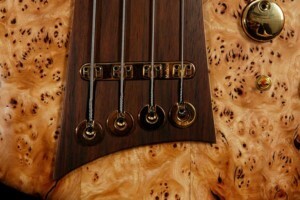 The bass has a street price of $5,950, which includes options and shipping. The price is not bad considering the specs and how is has an upright bass feel and sound.